You guys. 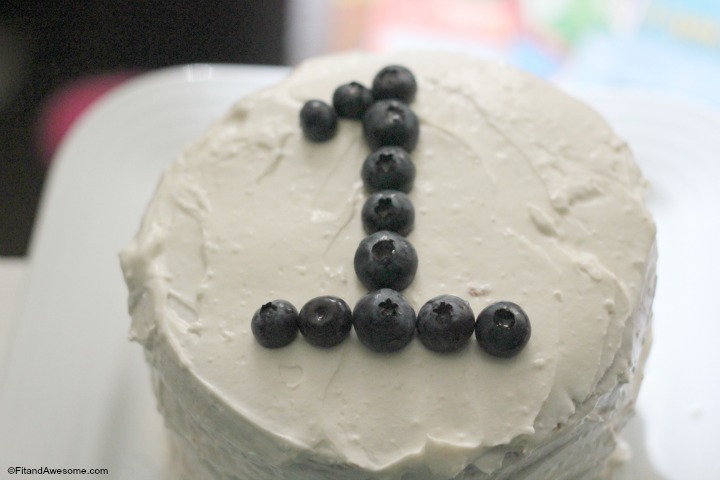 I can’t even believe I am saying this right now but Baby Awesome turned one year old! I can’t even believe it. The year has flown by. It seems like just yesterday we were learning the art of swaddling and learning about the 5 S’s from Dr. Harvey Karp and the Happiest Baby on the Block. Now our little baby is more like a little girl. She is wearing shoes and taking her first wobbly steps. Everyone says time flies by when you’re a parent. I thought they were just saying that. Nope. It really does. 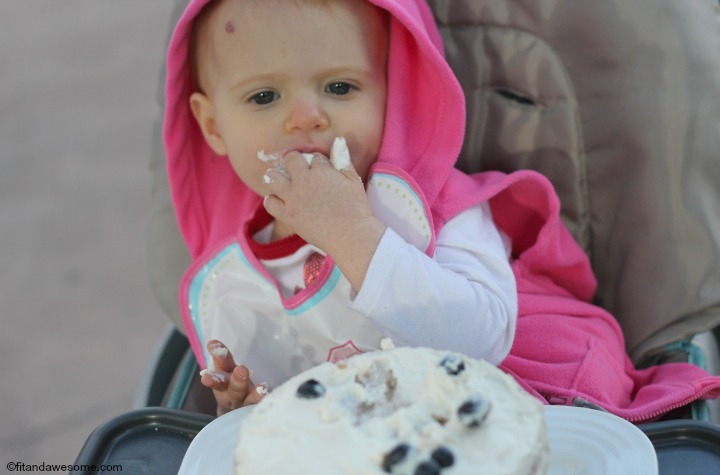 One thing I see a lot of people do for a first birthday is take pictures of their baby with a smash cake. If you don’t know what a smash cake is, it’s a cake that a baby is served at their birthday party that’s just for them to smash and destroy in front of family and friends. I loved this idea every since I first saw it and knew I wanted to do it for Baby Awesome. However, I was not too excited about the idea of giving her cake and getting her loaded up on sugar. She’s really only eaten fruits, vegetables, yogurt, chicken, and some beef at this point and I was worried about how much sugar is in cake and how it could upset her stomach (she has a sensitive tummy). I know that she will eventually eat sugar but my mother’s intuition told me that she wasn’t ready for it. That’s when I decided to make her a healthy smash cake. I’d seen people post online about making a healthy smash cake before so I looked online and found this great recipe by Fit Mama Real Food. The cake was made primarily from banana and the frosting was from cream cheese and apple juice concentrate. I decided to give it a go. The recipe calls for flour, but since we’re a gluten-free kitchen I modified the recipe to make it gluten-free. Now, Baby Awesome is NOT gluten-free. I just made it gluten-free because a) that was the flour I had and b) I don’t cook with regular flour. 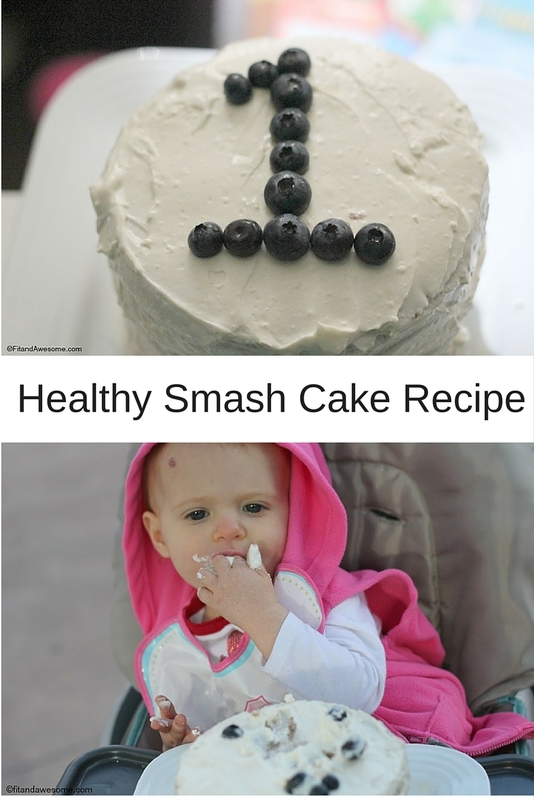 Here’s how I modified the recipe for our healthy smash cake. Preheat your oven to 375 degrees. Next, mash the bananas and add in the applesauce in a medium-sized bowl. Then mix the gluten-free flour, baking soda, and cinnamon in a separate bowl. Add the banana / applesauce mixture, coconut oil, and vanilla extract and mix until smooth. My batter was a little bit chunky from the banana but it should be okay. Next, spoon out your mixture into the three cake pans. I had two 6 inch by 3 inch cake pans so I put the mixture into two of the pans and then did the third later. You can do it however suits you best. Bake for 20 minutes. Once the cake it cool, you can begin “assembling” and frosting your healthy smash cake! First, soften the cream cheese by putting it in the microwave for 20 seconds or so. You will find that the frosting is hard to mix on your own. I tried to blend it by hand and it just didn’t work. I put it in my KitchenAid Electric Mixer and after a few minutes alternating from low to high speeds it was the perfect consistency! You could also use a hand mixer for this, too. You will know when it’s done because it will be nice and smooth. I was pretty generous in frosting this healthy smash cake because I knew that Baby Awesome wasn’t going to eat the whole thing. I was really happy with how it turned out. The result? Totally smashable healthy goodness. She loved it! She took the blueberries off the top and kept eating and eating the cake to the point where we had to take it away from her. When we did that she cried. I’ve heard that some babies don’t have interest in their smash cake. Well, ours sure did. Haha! I tried a bit of the cake myself and I thought it was pretty good! I would definitely make it again as another healthy cake option for a child’s birthday party. What about you? Have you heard of a smash cake before? Would you make a recipe like this for your baby or yourself? Post in the comments and let me know! 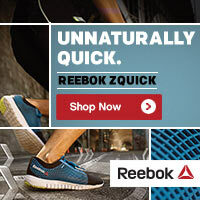 *Disclosure: This post contains Amazon Affiliate links. I was super excited to try this recipe for my son’s first birthday party tomorrow. I’ve followed the direction step by step and I have to say I’m really disappointed. I used half of the batter in a 8 by 4 round pan and it’s taken 1 hr 15 to bake so far…And it’s back in the over again. It’s liquid mush in the middle. I used the remaining batter to make cupcakes and those seem moist but the most important part is a mess. Looks like I’m headed to the store tomorrow to pick up a not so heathy smash cake in the morning. I’m really sorry to hear this. That seems like a long time for it to cook and not bake. Are you located somewhere with high altitude? Can you turn the temperature up a bit to try and get it to cook? I posted exactly what I did and it was not mushy for me. I know how stressful it is to plan for a one year old’s birthday party and truly very sorry this recipe did not work out. I baked this last night without the icing and left it out covered over night. Today there are little mushy spots, is it still good to eat? Is this okay and normal? I also just finished the icing and it is rather cheesy than sweet? Yes, I found the icing to be more cheesy than sweet as well. We preferred that over having a super sugary icing. Also, the mushy spots are normal and totally fine to eat. Hope your cake was great! Vanilla extract…doesn’t that have alcohol in it? Are you saying 1 (qty) 1/2 cup of applesauce, or just 1.5 cup of applesauce? Oh come on! Seriously?That’s why it’s still mushy after an hour!!! Ack I’m sorry! I’m editing the recipe now so it’s more clear. Hi mama! I realize this is an old post but just made this for my baby! I havent iced yet but wow turned out fantastic!! Im so excited about this healthy option. i had a piece of the left over from the cut out! So good!! thank you for the post was so simple!!!!! Awesome! 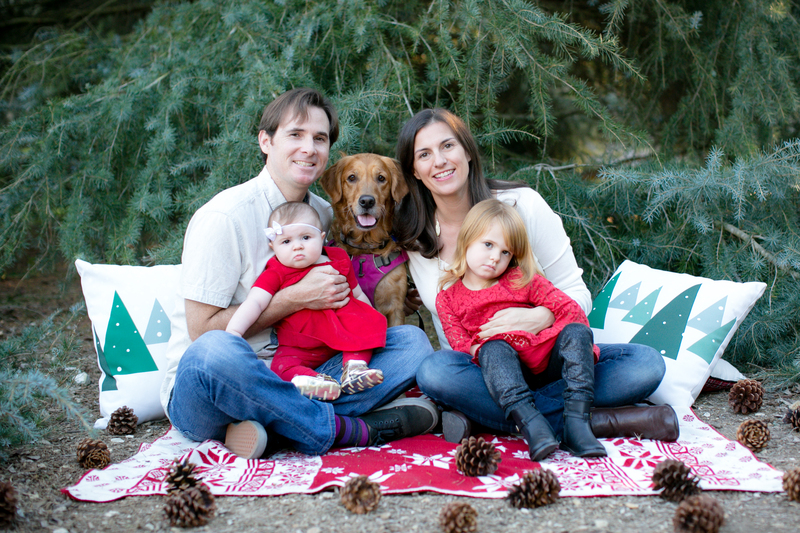 I am so glad it turned out well and your baby liked it! 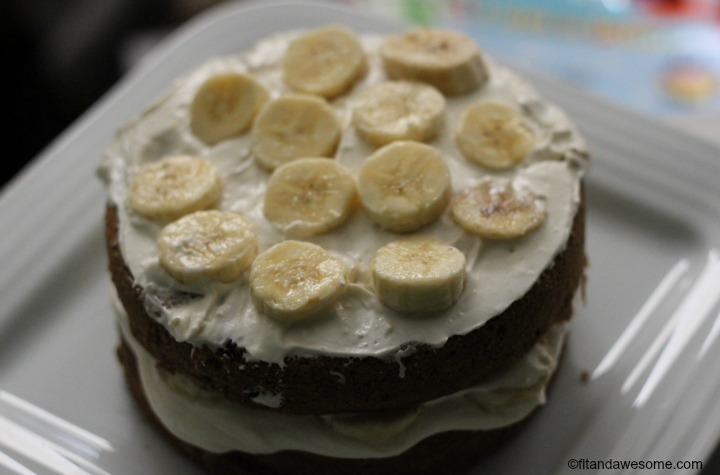 How many grams of bananas for this recipe? Can I bake this the night before, put it in the refrigerator, and then ice it the next day? Yes I think that would probably even work better! I made this for my daughter’s birthday yesterday and my husband and I just snacked on leftovers! I think the cake part is also a great banana bread recipe! I might make it in the future and use it as such 🙂 thanks for this!! You’re welcome! So glad it worked out and happy birthday to your daughter! Couldn’t find that gluten free all purpose flour in that brand only pilsbury and not sure I like what it has, do you think almond flor could work? Hi! I think Almond Flour would work. Let me know how it turns out! Your recipie looks great! Would this work with whole wheat flour? I’m not used to cooking with gluten free flour and it’s not a concern for me. Would it work if I use oat flour instead?! Hi! I haven’t tried oat flour but I think it’s worth a shot. Let me know how it goes. Would this work the same with regular all purpose flour? My daughter’s bday is this weekend! Hi! I haven’t made this with regular flour, but I imagine it would turn out similarly. Happy bday to your daughter! Hi! I made this cake last week and have a couple suggestions for you. First, increase the temperate to 400 degrees and cook for 30 minutes instead of 20. Let me know if that helps. Thanks!